60’s Rockerama Live Music Benefit. 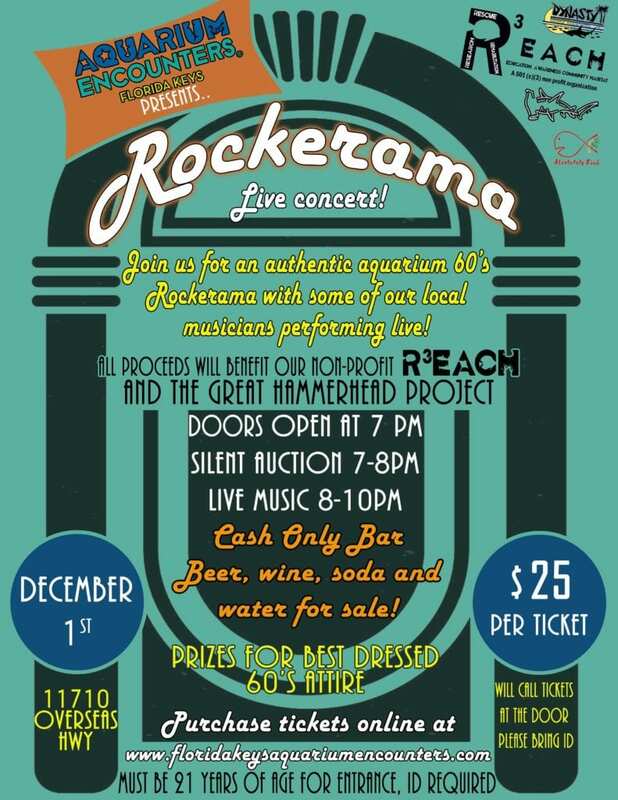 Marathon Aquarium Sponsors 60s Rock Show to Benefit the R3EACH and the Great Hammerhead Project. On Saturday night, December 1, Marathon Aquarium Encounters will present its “Aquarium 60s Rockerama” – a live rock and roll show featuring exclusively 1960s Rock and Roll music on stage teamed with projected music videos of the originals artists performing those very same songs up on the big screen. Seating is limited and usually these productions sell out before the event. Young describes the show as a sort of “College of 1960s Rock” for everyone who loves the high energy music from that great decade of pop. He states that only the radio hits of the 60s will be performed in the loud and boisterous dance hall style of that era – with no digital gimmicks, no programing, no pre-recording or even board balancing. It’s just plug and play amps and hope for the best, which is the way it went back in the analog days of the 60s rock world. Above the stage will be a large screen where the audience will view as each song is performed ancient video clips of the original artists doing the very same song as those performers filmed themselves back in the 60s. This will include period music videos (some of the earliest ever made), film clips from the movies in which the performers appeared, tv shows where they performed, and other obscure visuals of these rock masters from the 60s. Richard Warner, the film maker of “Wilma the Witch,” “Marathon After Midnight” and other Keys based movies, is producing the visuals specially for this event. Warner says that he has found many obscure visual scenes of these bands he never knew existed and seeing these great performers come alive on the big screen after all these years is a bit spooky since so many of them are no longer alive. The tickets for the event warn the attendee that the 60s music will be loud so that this will be an “intense audio-visual experience – viewer discretion is advised.” Because there is a cash bar, no one under the age of 21 will be admitted and all transactions at the venue will be cash only. All guest must bring ID.